There has been a recent renaissance of private space companies, bringing with it many successes and a few failures. Elon Musk’s SpaceX is one of the new players with its Falcon 9 rocket. This picture shows the SpaceX Dragon spacecraft on its way to resupply the International Space Station, just after the second stage separation of SpaceX Falcon 9 rocket. 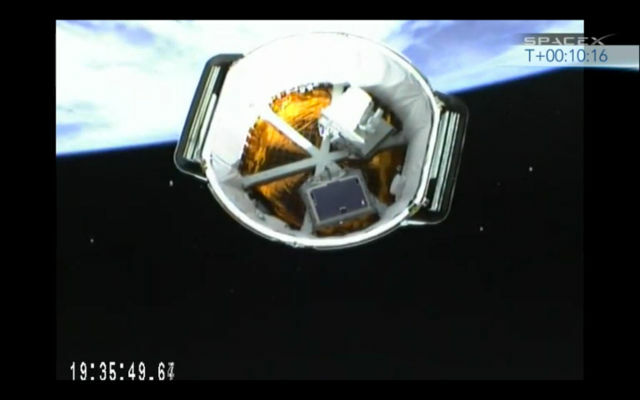 Dragon was carrying the Optical Payload for Lasercomm Science (OPALS) communication being managed by JPL. The OPALS components can be seen in the bay and were deployed as part of this April 2014 ISS supply mission.